I had a play with my distress inks and 2 coordinating Dahlia stencils from Altenew. I used worn lipstick, squeezed lemonade and citron to create the background. I die cut the GMD birthday wishes sentiment from citron and worn lipstick, adding black die-cuts beneath them to help them stand out a little more. I went with some light summery colors and needed the touch of black so they didn't blend completely into the stenciled background. I added some tiny black gemstones to finish this card. I'm not so sure I like this - I'm thinking it may have looked better if I'd done the sentiment words in black. I may die-cut them in black and layer them on top before I'm ready to mail this card. I'm entering this into the Simon Says Stamp Wednesday challenge - Simon Says Stencil it. Thanks for stopping by and do have yourself a wonderful Friday! These are so pretty! I haven’t seen these stencils before. You have done a great job with them, looks flawless! Love the effect of the same tones for the background and the sentiment! Your stenciled panel looks great!!! Well done! A beautiful card Carol, a fabulous background and lovely colours - so pretty. 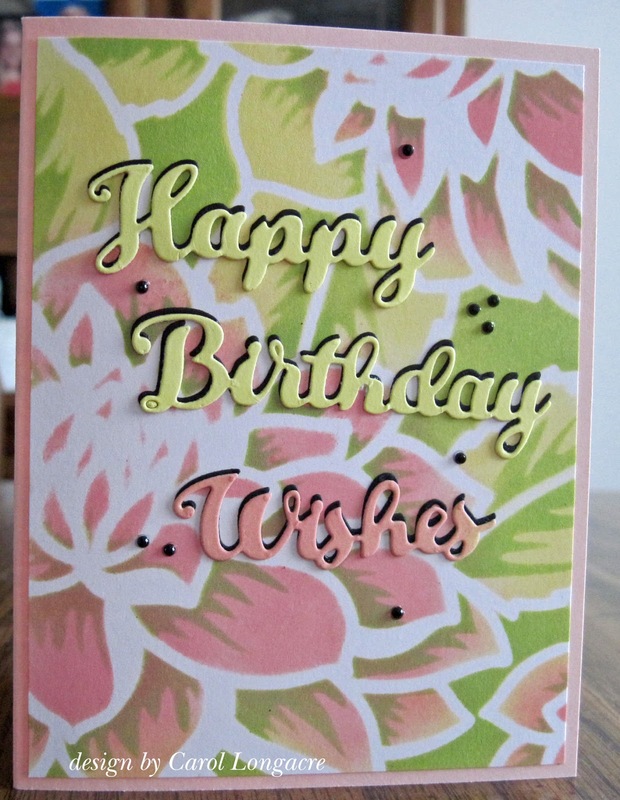 This is such a gorgeous card and I think I have those stencils and never got to using them. I best get busy and dig them out soon as this card is awesome in every way. I love the colors. That is one gorgeous stencil, my friend. You are so right about it being summery. I might like the black, but I do like it this way, also. I love these colours - they have great presence. Gorgeous! I love the colors and that stencil you used is so pretty. Beautiful card! Those colours are perfect for the gorgeous dahlias Carol and the shadowed sentiment really pops! Neat background, Carol I also like the colors you Used. Nice Cheery Card! I love the way you did your background. I think the sentiment looks awesome the way it is. Black would look good too, but honestly this way looks really pretty, too. I love how you added green to the pink flowers.Thank you for joining us at Simon Says Stamp Wednesday Challenge Stencil Challenge.